Creating a bank rule in Pandle enables you to automatically categorise and assign tax codes to the imported transactions which match the rule conditions you have selected. Once your bank rule has been created you will also have the option to 'auto confirm' any transactions which your bank rule applies to. Bank rules will only apply to transactions which have been automatically imported through a bank feed or file import, they will not apply to transactions entered manually into Pandle. You will need to enter a Name and Description for your Bank Rule, we recommend making your Description as informative as possible. 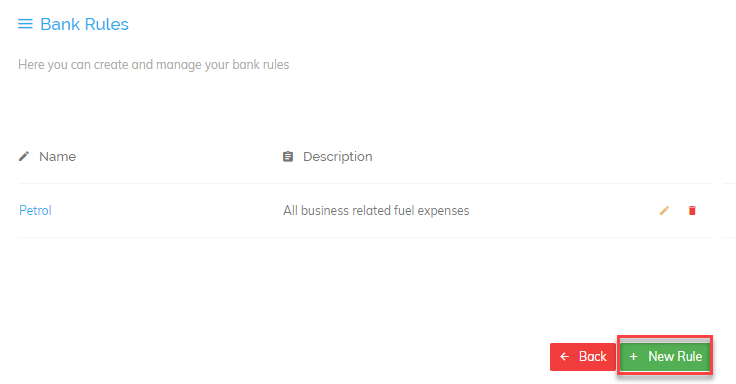 This way, if you set up a number of different bank rules they will be easy to identify from the Bank Rules summary page. 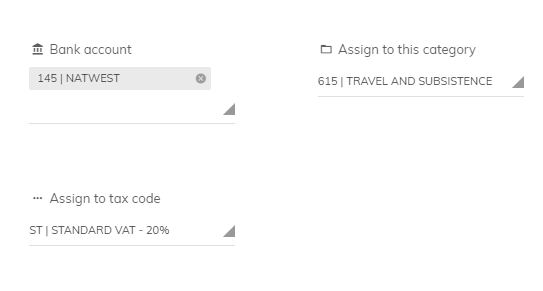 You can choose to edit any part of your rule conditions to ensure they will apply to all similar transactions you wish to automatically categorise and assign a tax code to. But as the Description includes a date which will not be relevant for all future petrol purchases from this station we will change the Rule conditions to Include just the keyword 'PETROL' and remove the amount rule condition so that the Bank Rule will apply to any petrol purchases, no matter the transaction value. If you are creating a Bank Rule for your Recurring Transactions then you would leave the amount rule condition as Pandle had populated it so that the Bank Rule would always apply to these recurring transactions of the same value. You will then need to select the category that you want the Bank Rule to assign to this transaction and any future transactions which meet the rule conditions. In this example, the category will be 'Travel and Subsistence'. Once you are happy with your rule conditions, bank account and which category and tax codes will be assigned to these transactions click the 'Apply This Rule' button to create your Bank Rule. You also have the option to 'auto confirm' the transactions which this Bank Rule applies to. This enables Pandle to automatically check and confirm these transactions for you, although you can still check through them later under the Confirmed tab of your imported bank transactions. When creating a new Bank Rule from scratch you will be required to set your own rule conditions to control which of your imported transactions will be automatically categorised and assigned a tax code by your Bank Rule. For example if you wanted to set up a New Bank Rule for all of your train tickets purchased from Trainline you would select Description - Includes - trainline. After you have set up your rule conditions to control which transactions this Bank Rule will apply to you then need to select which Bank Account these transactions will appear in, followed by the category and tax code you want assigned to these transactions. Using this same example we would select our main business bank account 'Natwest', followed by the Travel and Subsistence category and Non VATable tax code (as train tickets are zero rated). You will again have the option to 'auto confirm' the transactions which this bank rule applies to, enabling Pandle to automatically check and confirm these transactions for you.